I saw the anime many years ago when it first aired. Ever since then I have wanted to check out the manga, especially since that one goes further than the anime, and I really wanted to know how it continues. Sumika is in love with her best friend Kazama (even though she disses girl love at a daily basis) , sadly Kazama doesn’t see Sumika as that (she falls for more cute girls), will Sumika get together with Kazama? The manga art style is really cute and I love it. And of course, I am soooo happy to see Sumika and Kazama again. It is wonderful, they were (in the anime) great characters and I was cheering for them both to get together. Sumika is a lovely character, though she really needs to be honest and just go for it, instead of deflating every time her friend says something about her (Sumika) not being her type. Also, Sumika should ditch the glasses, she looks so pretty without them. The glasses make her look too serious and too scary at times. And of course we also have the guy who crossdresses. I totally forgot about him (yes it is that bad), but now that I read the manga it all comes back. Well I loved this volume, and I will be sure to read the rest of the manga too. 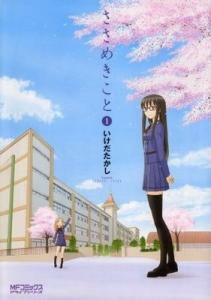 I would recommend this to all who likes shoujo-ai/yuri.